The following appeared in Bloodhorse.com on April 6th. 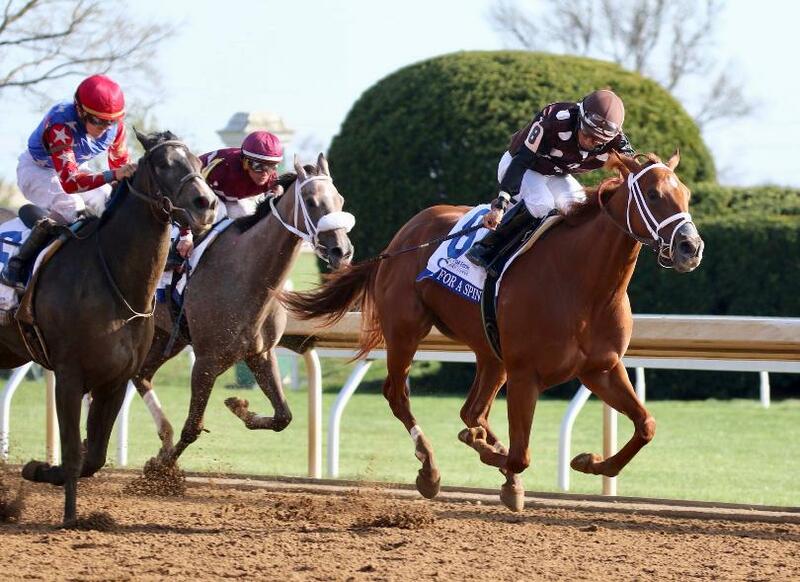 Virginia-bred Out for a Spin prevailed at odds of 52-1 in the Grade I Ashland Stakes April 6th at Keeneland. She was bred by the William Backer Revocable Estate. Now, it’s onward to Churchill Downs and the Kentucky Oaks on May 3rd. 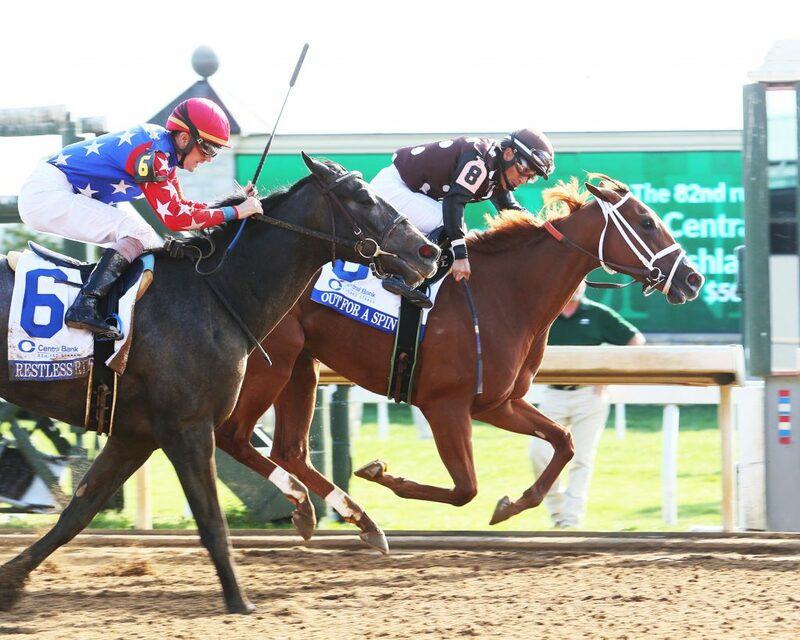 Commonwealth Stable’s Out for a Spin pulled off a 52-1 stunner in the $500,000 Central Bank Ashland Stakes (G1) April 6 at Keeneland. The 3-year-old daughter of Hard Spun entered stakes competition for the first time Saturday for trainer Dallas Stewart and turned back 5-2 second choice Restless Rider with a gritty run under Paco Lopez after putting away even-money favorite Jaywalk off the turn for home. The final time was 1:44.95. 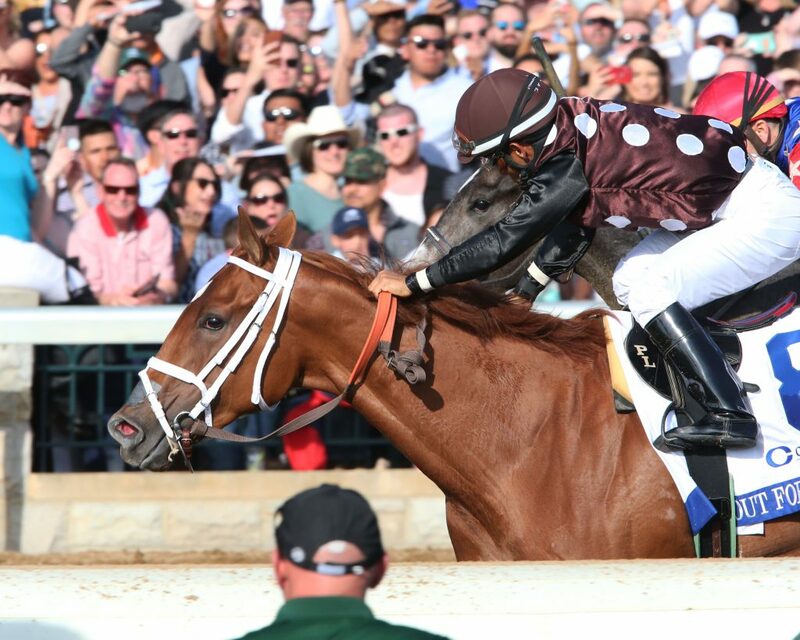 The top three should meet again in the May 3 Longines Kentucky Oaks (G1), as both Restless Rider and Jaywalk are expected to continue on to Churchill Downs. Out fof a Spin upset the field in the April 6th Ashland Stakes. 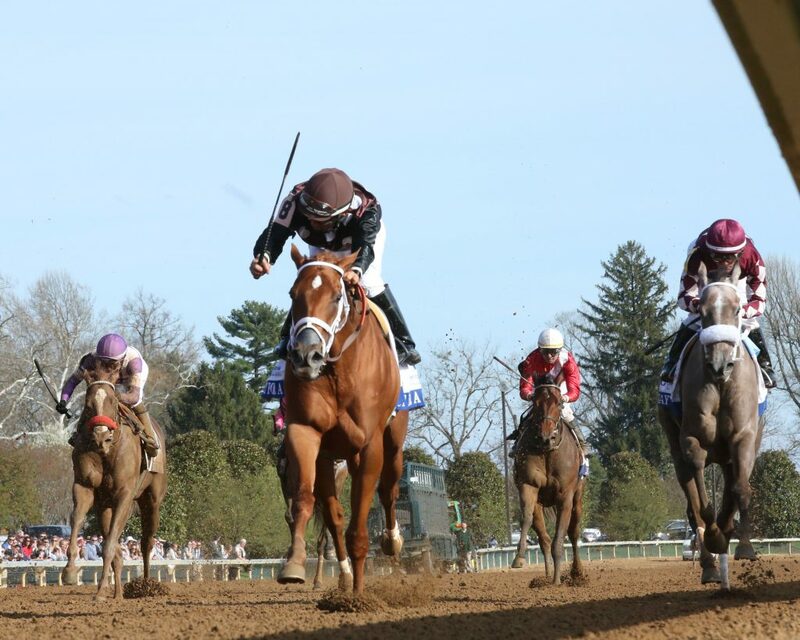 Photo courtesy of Keeneland. Victory in the 1 1/16-mile Ashland gave Virginia-bred Out for a Spin 100 points to rank fifth on the Kentucky Oaks leaderboard. Restless Rider ranks eighth with 62 points, and Jaywalk is 10th with 55 points. Out for a Spin’s victory was sweet salve on the wound sustained by Stewart just one race prior, when his trainee Cathedral Reader was vanned off and euthanized after sustaining a catastrophic injury to her right front leg during the Madison Stakes (G1). Out for a Spin prevails in a close finish. Photo by Coady Photography. Entered off a 3 3/4-length victory March 16 in a 1 1/16-mile allowance/optional claimer at Fair Grounds Race Course & Slots, Out for a Spin broke alertly and was forwardly placed three wide into the first turn as Jaywalk took the lead. The eventual winner rated second while the champion 2-year-old filly of 2018 set opening fractions of :23.19, :46.46, and 1:11.60, then Lopez made his move around the far turn. Out for a Spin took a short lead as Jaywalk began to fade, but Restless Rider, making her first start for trainer Ken McPeek since late November, came to her with a determined run under Brian Hernandez Jr. The two hooked up stride for stride, but Out for a Spin would not be denied the hard-fought decision. She returned $106.20 on a $2 win ticket. Out for a Spin now has three wins and a third from five starts, with earnings of $354,903. She was bred by the William M. Backer Revocable Trust out of the Came Home mare My Mammy, the dam of stakes winner Sweet Victory and stakes-placed Ferdinanda. The mare produced an Uncle Mo filly in 2018 and was bred to Malibu Moon for 2019. A head on shot of Out for a Spin in the stretch drive of the Ashland Stakes. Photo by Coady Photohgraphy. Hernandez was proud of Restless Rider, who won the Darley Alcibiades Stakes (G1) at Keeneland in the fall and turned in her third consecutive runner-up effort after seconds in the Tito’s Handmade Vodka Breeders’ Cup Juvenile Fillies (G1) and Golden Rod Stakes (G2), both at Churchill Downs. John Servis, the trainer of Jaywalk, echoed McPeek’s sentiments regarding his own runner. Out for a Spin (inside) at the wire. Photo by Coady Photography.